8/1/17: the FCC Further Notice of Proposed Rulemaking discussed below is currently in 'public draft' status, and is scheduled to be considered by the FCC during its August 3rd Open Commission Meeting. The article below has been revised to reflect the draft status of the document prior to the August 3rd meeting. 8/3/17: the FCC approved the FNPR this morning, look for it to appear soon in the Federal Register. 8/24/17: the FNPR was published today in the Federal Register which means that the deadline for comment is September 25th. 9/21/17: the comment period has been extended to October 10, 2017. On July 13, the FCC released a public draft of a Further Notice of Proposed Rulemaking (FNPR) related to Form 477 broadband data collection. If approved, the FCC will seek comment during a forthcoming 30-day public comment period. This may be a chance for you to weigh in on an important nationwide data collection tool. The FCC’s FNPR document provides a sneak peek of potential forthcoming changes to Form 477 mapping of mobile, fixed broadband technologies, and even how satellite-based services are mapped. For me, the section pertaining to the granularity of mapping landline and other fixed broadband technologies is where the FNPR really gets interesting (pages 10-17). Paragraphs 32-43 discuss and seek comment on issues and possible remedies associated with the current Form 477 mapping at the census block unit. 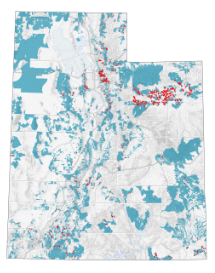 And, while census block geography has many, many benefits, its limitations should be understood and certainly apply to areas other than broadband. Inherent and difficult-to-resolve issues with geocoding. Without stating it explicitly, the FCC’s draft FNPR seems to indicate that for proper analysis to inform and track services policy like broadband, two inputs are needed. The first is a granular map layer of service availability (broadband coverage and speed). The second is the precise geographic location of potential users expressed as housing, and presumably business units, including those at a sub-address level. The latter of which would be best sourced and sustained through a process that connects with the best public and private data resources, well outside of the Form 477 submission process. Commenters to the proposed FNPR will likely substantiate the importance of such a two-pronged approach. It’s the only way to accurately and precisely understand and measure the work yet to be done to ‘connect’ America, especially in rural areas. Another comment that should prove easy to make is that a comprehensive national address database is key to another FCC area of interest, 911 Emergency Response. And, for that reason, it would be greatly in the national interest to build and sustain a national address database (and of course subaddresses!) in geographic form. Lastly, I want to point out that NSGIC and its members are uniquely positioned to provide thoughtful, valuable comments to FCC on this FNPR should it be put forward. Many NSGICers were active in the broadband data collection and mapping funded through NTIA from 2009-2014. Virtually all states have been actively using broadband mapping data to support policy initiatives. And, all of us have involvement with planning and/or implementation of state address point initiatives. We know these issues well from our geospatial coordination experience, our perspective on data collection challenges, and also as users of the geospatial data to support policymaking. Who else can make that claim? Hopefully, you’re connecting with some of the opportunity associated with the proposed FNPR. We encourage you to spend some more time with the document itself and, should it be adopted by the FCC, start thinking about what observations and thoughts might be relevant and worth submitting. In the meantime, please feel free share your comments and ideas here.